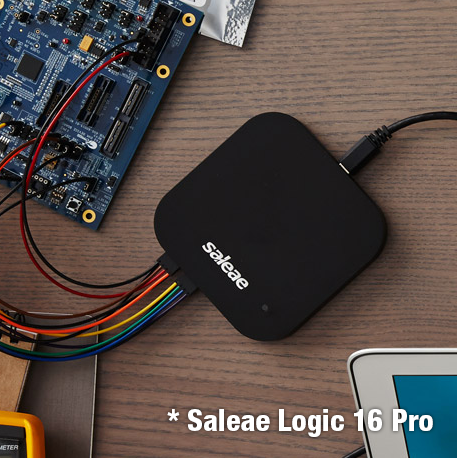 "Debug hardware like the pros with the logic analyzer you'll love"
Saleae's Logic is a logic analyzer used to record, view, and measure digital signals. Logic comes in 3 models viz Logic 8, LogicPro8 and Logic Pro 16. Every Logic device can be customized to capture data the way you want. You can select how long to record, specify how bandwidth is allocated between digital and analog recoding, select which channels to record, and even make the LED your favorite color. Most digital communication uses a particular protocol that specifies how information is transferred. The Logic software has protocol analyzers that can automatically decode SPI, I2C, serial, 1-Wire, CAN, UNI/O, I2S/PCM, MP Mode, Manchester, Modbus, DMX-512, Parallel, JTAG, LIN, Atmel SWI, MDIO, SWD, LCD HD44780, BiSS C, HDLC, HDMI CEC, PS/2, USB 1.1, Midi- or create your own with the SDK. Enjoy on Windows, Mac, or Linux. Logic models come with 3 years warranty.